Working from home has become a common occurrence these days. But, trying to find the ideal space within your home where you can ensure productivity can often pose a challenge. A freestanding studio home office may be just the solution to this problem. Building one of our studio home office plans reduces the amount of distractions and increases productivity, plus it can be used also as a hobby area, exercise room, art studio, or more. Take a look at this terrific selection of designs and find one perfect for your work situation. 1027 Sq. Ft., Width 24'-10", Depth 32'-10"
413 Sq. Ft., Width 22'-0", Depth 18'-9"
361 Sq. Ft., Width 19'-0", Depth 27'-0"
99 Sq. Ft., Width 10'-0", Depth 11'-0"
405 Sq. Ft., Width 21'-0", Depth 21'-0"
350 Sq. Ft., Width 24'-0", Depth 36'-0"
432 Sq. 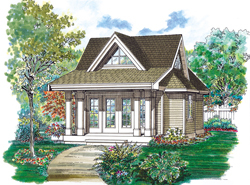 Ft., Width 20'-0", Depth 30'-0"
Our collection of studio home office plans includes many styles and sizes perfect for your ideal work layout. We offer detailed blueprints that allow you to visualize the look of the entire finished space, down to the smallest detail. With a wide variety of plans, we are sure that you will find the perfect do-it-yourself project to fit your needs and style.